Yet another week of A10 action has concluded, and we have some old faces returning to the top 5. Here is my weekly A10 Player of the Year Rankings. Hope you enjoy, let me know what you think! Jack Gibbs, Davidson– Gibbs keeps the number one spot after a stellar 37 point performance against VCU. Despite facing one of the best defenses in the country (13th in defensive efficiency), Gibbs was able to shoot 55% from the field. He just refuses to give up the number one spot. DeAndre Bembry, St Joe’s– Bembry edges out Terry Allen for the two spot this week. The 6’6 forward had 13 points, 6 rebounds and 3 assists against UMass. Bembry shot 23% from the field against the Minutemen, playing all 40 minutes.This is highly uncharacteristic of Bembry, look for him to rebound against URI on Saturday. 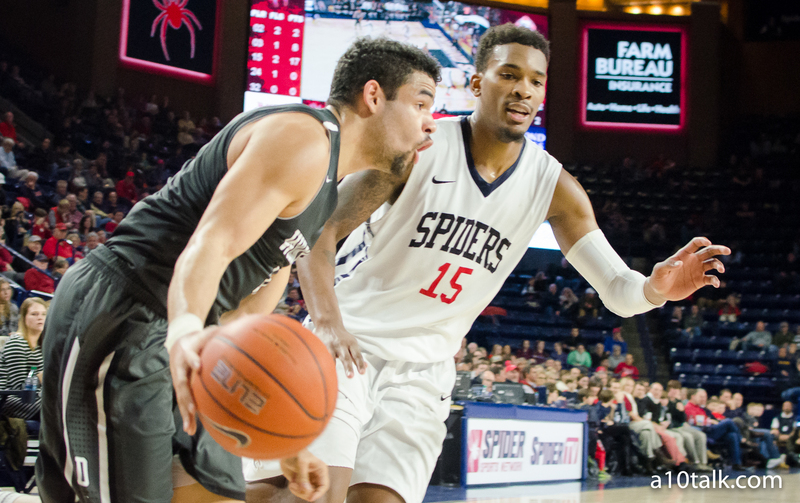 Terry Allen, Richmond- Allen has been the most consistent player in the A10 all year. Terry has scored in double digits for 29 straight games dating back to last year. Shooting 6-6 from the floor, Allen had 15 points along with 4 rebounds in a 2OT win against GW. Allen could have had more if he didn’t commit a foolish fifth foul at the end of regulation. Isaiah Miles, St. Joes- Miles sneaks back into the top 5 this week after a dominant performance against UMass. The 6-7 forward has 27 points along with 12 rebounds. Miles is one of the most improved players in the country, he has been silently going to work all year. Time will tell if he stays in the top 5 or not.